Both sustainability ambitions and obstacles are growing exponentially. This begs for expectation management as arguably performed by Future Earth: In addressing the advisory role of science in sustainability, Future Earth is building advisory capacities and raising expectations at the same time. These expectations – not least, those directed to itself – rightly challenge the linear models of evidence-based policy making. As an alternative to “speaking truth to power”, debates at Future Earth often point to the concept of co-creation. In a conventional understanding, co-creation refers to the collaboration of heterogeneous actors from civil society, academia and policy making in shaping sustainability solutions. Formats such as Future Earth’s Knowledge-Action Networks create space for heterogeneous actors to co-produce or even problematize sustainability solutions. Co-creation, I argue, can moreover help to clarify and incorporate the need and the capacities for expectation management. 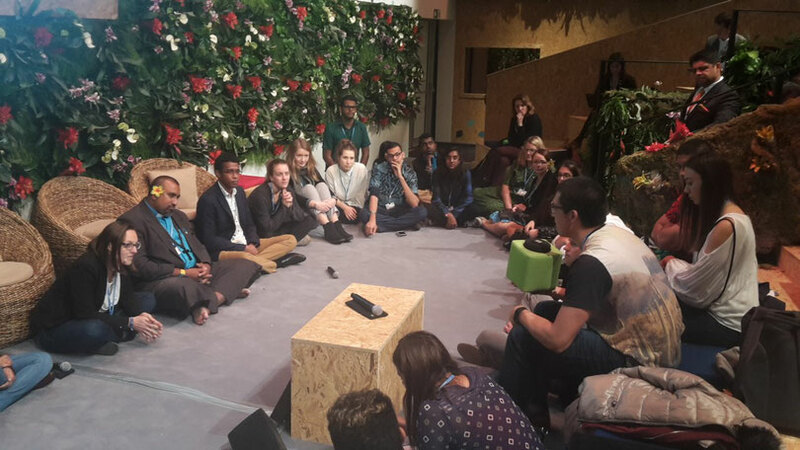 At COP23, an intervention by the Fijian delegation encouraged participants to engage with their expectations in a broad, and surprising way. Two weeks ago in Bonn, Fiji’s Prime Minister Frank Bainimarama introduced the concept of Talanoa. To find out more, I spoke to Fijians at the Fiji pavilion and to COP participants I encountered in the so-called Talanoa Space (a wooden, arena-like discussion stage amidst the more fair-like booths of NGOs and research institutes). According to their brief explanations, Talanoa comprises of a patient style of conversation at eye level. Given the dire situation of the pacific islands in the midst of rising sea levels, Fiji has joined the push for more aggressive goals. But, it has also called for new forms of dialogue to do so. Fiji and other proponents of Talanoa, for example Barbara Hendricks, acting German Minister of the Environment, seem to be willing to further complicate expectation management: Future expectations would be discussed in line with mutual expectations amongst a broadened set of actors. Moreover, a Talanoa dialogue would give space for actors to articulate their self-understandings. Fijians and their supporters thus seek to manage social, temporal and self-directed expectations at the same time. Really making broad expectation management happen is complicated. Be it Future Earth or the Talanoa Dialogue – platforms that strengthen future ambitions while gathering heterogeneous actors play a double role: they seek to build the capacities for co-creative forms of policy advice, and they push the boundaries of what can be expected from co-creation. They raise the bar while jumping. But, are they falling over? I argue that, especially in sustainability, dialogical expectation management is direly needed. When expectations among actors are increasingly in conflict, only reflexive understanding and collective practice can help to push sustainability ambitions. Especially when dialogue is at odds with pushing for higher ambitions, it is high time for a combined form of expectation management. One would have to articulate future expectations, communicate mutual expectations, and raise one’s own self-efficacy all at the same time. How to do that? Co-creation is currently discussed as a stepping stone towards new styles of policy advice. Certainly, a co-creative practice transcends the notion of “speaking truth to power”. More interestingly, co-creation is a viable and encouraging route, when future ambitions and pragmatic constraints are rising concurrently. While co-creation promises a methodological response, it is also intrinsically linked to the expression of mutual expectations. Eliciting social needs and desires, as is the current focus of most co-creative endeavors, may not always compliment future-driven or self-oriented expectations; when overwhelmed with what others expect from them, actors may lose sight of future expectations; and when confronted with challenges to their own ambitions, actors may be paralyzed by the need to reflect or re-orient their expectation. Current sustainability conversations revolve around a key question: How to remain ambitious and persistent, while settling for the means at hand? Co-creation, one of the means currently at hand, is a plausible way to do so – the introduction by the Fijian delegation of Talanoa into the COP- conversation indicates that. Yet, co-creation can only be encouraging if there are solid answers to two questions: Why to engage? And how to create an arena where heterogeneous actors feel able to collaborate in creating mutual expectations and expected futures? Raising the bar, while jumping, is a risky exercise. Yet, it also represents an opportunity for playful and broad expectation management. At the 3rd German Summit, Future Earth, actors are convened to increase future ambitions. That is raising the bar. Not to fall over implies that co-creation also explores mutual expectations, and actors’ capacities to meet them. Many thanks to Katherine Farrell, Humboldt-Universität zu Berlin, for reviewing this post.